Intel has released a tech demo that shows how to efficiently use the multi-cores CPUs to build a parallel game engine. This tech-demo uses Intel Threading Building Blocks for CPU threads management, OGRE for 3D rendering, Havok for physics simulation and FMOD for the sound. 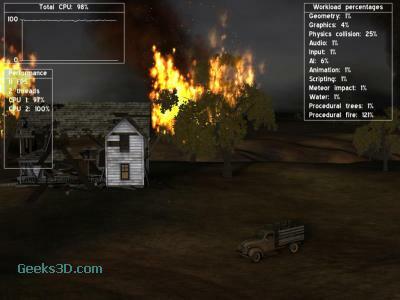 Link: Smoke – Game Technology Demo. E8500 @ 3.16ghz gets 19fps on average here, not that it should matter too much but gfx is 4850. My mighty Celeron D330 @ 2.6ghz and nv6200 gets 1fps. All of the srouce code is available at the given link. Please feel free to download it and see how it all works. I’d love to hear what people are doing with Smoke. If anyone is working on Smoke or has more comment… please post on the Intel forums too (http://software.intel.com/en-us/forums/whatif-alpha-software). It’s easier for me to track them over at Intel’s forums. Thanks for these precisions Orion!